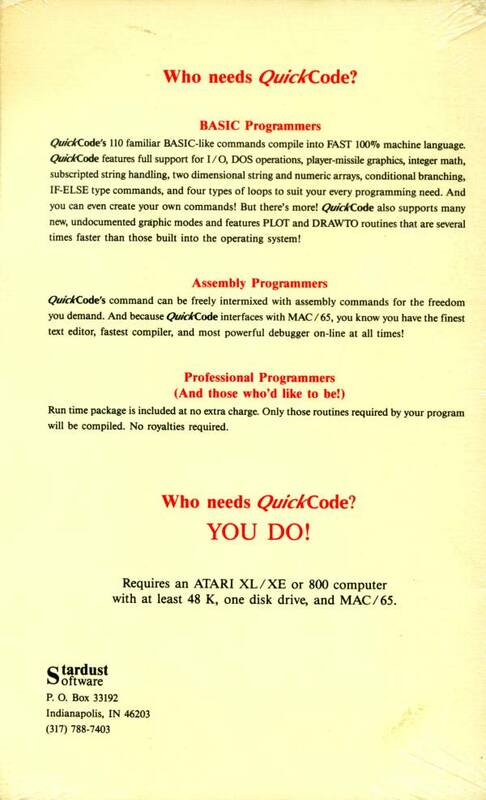 QuickCode is an amazing collection of macros for the MAC/65 assembler. It turns Assembly Language into a high level, BASIC-like language. Of course, it retains the speed, flexibility and compactness of assembly code. 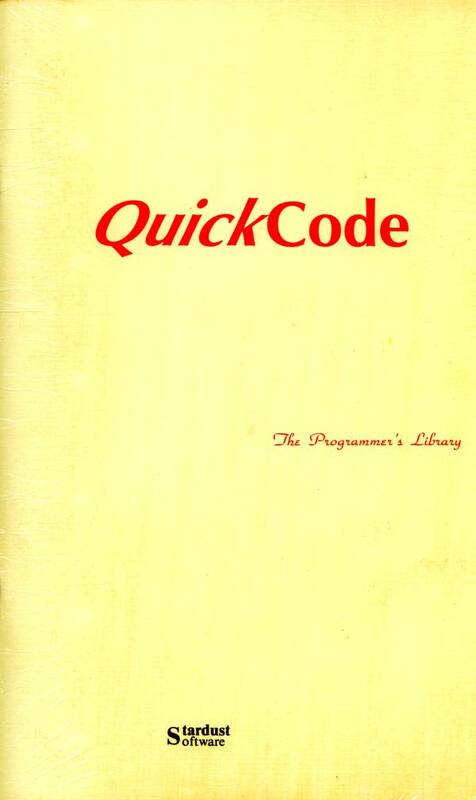 The manual claims that you don't need to know Assembly Language, just learn to operate MAC/65 and program as you would in BASIC. That strikes me as an exaggeration, but not a very big one. Program control macros include GOTO, GOSUB, RETURN, WAIT, TRAP and multi-line IF-THEN-ELSE-ENDIF, as well as the multi-choice CASE, ON-GOTO and ON-GOSUB. Loops include FOR-NEXT, DO-OD, LOOP-ENDLOOP and WHILE-ENDWHILE. QuickCode has full variable support, including one and two dimension numerical and string arrays. It also has a special high-speed "indexed string" data type. Macros exist to transfer data from one type to another. I/O macros include OPEN, CLOSE, NOTE, POINT, PRINT, INPUT, PUT, GET, BPUT and BGET DOS commands include FORMAT, DELETE, RENAME, LOCK and UNLOCK. Graphics commands include GRAPHICS, SETCOLOR, COLOR, POSITION, LOCATE, PLOT, DRAWTO and FILL. QuickCode has better Player/Missile Graphics support than any other language, even Advan BASIC. It also has support for Vertical Blank Interrupts. There are even more goodies here, but I'll leave them for you to discover. The only downsides to this package are lack of support for floating point math (it only supports integers, see the Floating Point Package below) and a manual which is organized alphabetically instead of grouping commands by function. For instance, if you don't know that REPORT resets TRAP, how can you find it? All in all, this is a fabulous package. I wish it had been available years ago. It would have saved me weeks of coding. $34.95, 48K disk, requires MAC/65. Stardust Software, PO Box 33192, Indianapolis, IN 46203. (317) 788-7403.